She wrote this book after a whirlwind guided tour of Auschwitz, during which she took no photos. Where did she get the photos that she used in her book? She got them from my scrapbookpages.com website. Check out her book at http://carolynyeager.net/auschwitz-underground-guided-tour and let me know if you spot any photos that are not on my website. The two photos below were taken, by me, at Dachau, not Auschwitz. Photo of a page in Carolyn Yeager’s book. The photo on the left is my photo of the SS hospital across the street from the alleged Dachau gas chamber. The photo on the right is a photo of the alleged gas chamber which is across the street from the Dachau SS hospital. There are many other photos in Carolyn’s book, which were copied from my website and used without my permission. Now she has the nerve to write comments that are critical of me. No more! She has been kicked to the curb. Come to your own conclusions on the Auschwitz camp and Krema 1…. All the typical cliches from the HoloHuxster handbook. You gave a link to some videos about Auschwitz. I watched the first one to the end, but I couldn’t watch all of the second one — it was too boring. One thing that I noticed about these videos is that nothing was said about WHY these Jews were sent to camps. We are led to believe that, at a time when a war was going on, these Jews were sent to camps for no reason. The Jews who speak in the videos do not say anything about why they were sent to camps. I think that the Jews were sincere when they claimed that they didn’t know why they were sent to camps during war time. None of them said that they were sent to camps because Jews lie, steal and cheat. There was a war going on and the Jews were on the side of the enemy. I might be heading for a fall here, but I would put money on the fact that the photo on the right is actually Auschwitz 1. It has all the features relating to that Krema yet none of Dachau. Of course the HoloHoax books they’re not making money on them right and what are you paying for you paying for lied! So what book would you like to buy the lies for Mucho Dinero or her book $10 which is reasonable and not expensive. Jim. Your reply to my comment doesn’t make sense and is not related to anything I said????. Something is very odd in this whole photo issue, the photo is obviously not Dachau and the link supplied proves it. Oy Vey. On this page of my website, I have photos of the old crematorium at Dachau and a link to photos of the new crematorium. Yeager’s book was published first in 2010 under the ‘Barnes Review’ trademark which is a clearly too commercial publishing house. Yeager isn’t a real writer, she doesn’t know the basics. She didn’t provide a bibliography and she didn’t give credit to whoever she stole from, not to mention that her stuff is the old, boring out of date denial stuff that has been debunked decades ago and no serious denier use it anymore. But she and ‘Barnes Review’ are very demanding and in case you want to use a simple quote from her book, you have to cite not only her book’s info, but even the address of ‘Barnes Review’! Only from this you can understand that they’re in this business mostly for the money. And they’re doing this for 7 years now. A bibliography is never required — one can write a book which does not include a bibliography and still be a “real writer” — make a note of that. What exactly do you think she “stole”? — if you look at the image in this post, it says “PHOTO: SCRAPBOOKPAGES.COM” — so at least here she is giving credit for the foto(s), or trying to. So you think $10 for a book — that’s the max price you post — means they’re in it for the money. Yes, eah, sure, whatever, but the truth is people are of two kind: Those who always document and cite their work (like FG, for example, for who I never read anything from her work without references of ‘what’ and ‘where from’) and those who don’t care and do not hesitate to pile up whatever garbage they find on the internet. Anyone can judge which people do the right thing and which think of their readers as junk who do not deserve any respect. What exactly do you think she “stole”? Once you do that, then like I said…get lost — the last thing this blog needs is another dishonest idiot commenter. Since you commented about a book by Carolyn Jeager, what “garbage” are you referring to? — I think you ought to be an expert on “garbage”, oder? Yeager didn’t write anything original in her alleged ‘book’. It’s garbage even for a denier’s standards. Piling up stuff you found on the internet doesn’t make you ‘a writer’. It makes you just something a bit more intelligent than a xerox copy machine. You wrote: “What exactly do you think she [Yeager] “stole”? Yeager published a book, in which she included many of my photos of Auschwitz, without giving me credit for the photos, and without asking me if she could use the photos. Some of the captions that she put on the photos were wrong. Fredric Toben visits Auschwitz go 50 minutes in and he talks about Krema 1 in Auschwitz 1 again he is in Auschwitz NOT Dachau…. Correct me if I’m wrong…..since I wasn’t there I have to rely on what others have done and trust them. FG from your own site….I got the info from you??? 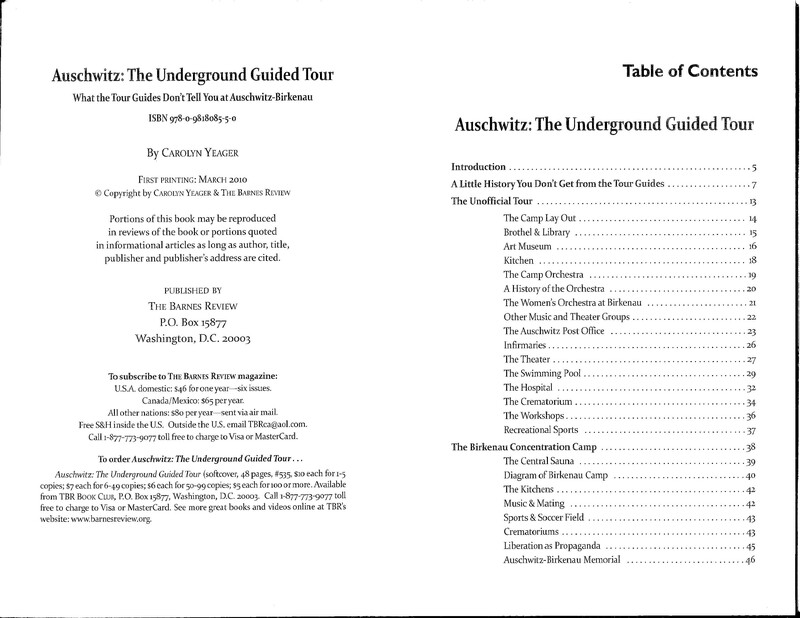 Is this tour guide of Auschwitz wrong? Who kicked her to the curb? And when? I kicked her to the curb today. You will see no more comments from her. It pops up among the images, if you google SONDERKOMMANDO, but it’s not to be found anywhere else. I only see one photo, but the missing photo that you claim that you took at Dachau, is NOT at Dachau ….. That’s the Auschwitz crematorium where Fredrick Toben filmed a video, and several other people took photos and filmed videos., including David McCalden and Ditlieb Felderer. Maybe I’m wrong, I’ve never been there. Maybe everyone is wrong and all the arguments about the Auschwitz crematorium throughout the decades have all been in vain…..they all got the wrong camp. The building on the right with the chimney as far as I understood was Krema 1 in the Auschwitz 1 camp unless there are two exactly the same one in each camp, which I’ve never come across in my investigation of the camps, from the convenience of my commuter. No that is a photo taken at Dachau. Go to this page on my website to see the old crematorium at Dachau; then click on the link below it to see the new crematorium at Dachau. The building in question was taken at Dachau. Sorry but the link goes to the page about Birkenau, not the main camp. And here is your page on Dachau. This is clearly a different crematorium. The photo on the right in your post *is* of the Auschwitz main camp crematorium. Yet you now falsely claim it’s from Dachau. Of course the photo on the right is a pic of Krema I in the Auschwitz Stammlager. The roof of the Dachau crematorium is not flat. It’s a gabble roof. When writing books it’s usually the custom to give credit to the photographer or at least where the picture came from if it’s online. I know I’m guilty of using a lot of pictures from all over the place even FG’s site. But I don’t make money on books with her pictures in them.